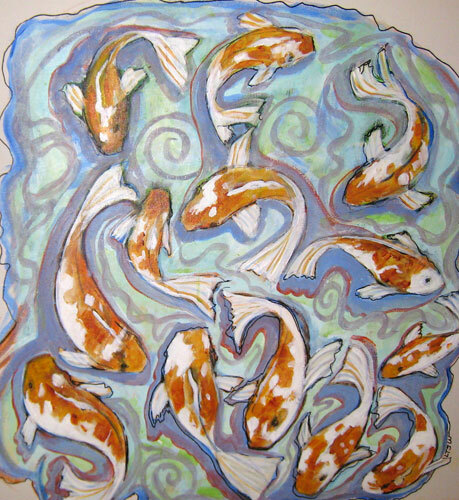 How Koi am I, (a work in progress) acrylic on canvas. This is the right side of a 24″ x 48″ canvas. Bob’s painting is on the other side. We’ll be showing this painting at our upcoming exhibition Whimsical & Refiguration at the MAD Gallery, in Art Alley, Monroe, Dec 5th & 14th. When we paint together, we call ourselves Hamilton Crosby, which is a combination of his mother’s maiden name (Hamilton) and my mother’s maiden name (Crosby). This entry was posted in Uncategorized and tagged Downtown Art Crawl, Linda Kay Thomas, Linda Snider-Ward, Louisiana artist, the MAD Gallery, the Ouachita River Art-Gallery, the Rive. Bookmark the permalink.